We're the new kids on the block in Pleasanton but the city always has a lot of events going on! Here are the July events we copied from their website. Enjoy! ArtBlock @ the 1st Wednesday Street Party! Live art demonstrations, local craftspeople and more! Band sponsored by Cafe Main and Baci Bistro and Bar. 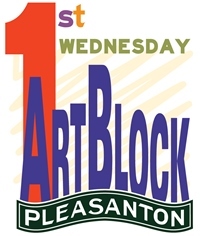 Location: Lions Wayside Park, Neal and 1st St.
Shop away the evening in downtown Pleasanton with a great glass of wine!